I have bought a couple Febreeze candles because I love the smell of them, but they were burnt down and charred. I decided I was going to do something about it. I started by boiling them in a pot with about an inch of water, until the wax melted and could be scooped out or poured out of the glasses. After the wax was out it was easy to just wash the glasses after to get the black char off, you could even throw it in the dishwasher if you wanted to. So what you need is just plain old white glue and any food colouring you have on hand. 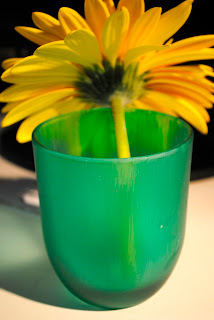 I used a sponge brush to paint the glue onto the glasses. I mixed 3 drops of the neon blue and 1 drop of the green to the glue to get the aqua sea glass colour I wanted. Then you just paint it on thin and let it dry. I ended up doing two coats. Then you can put whatever you want in it... 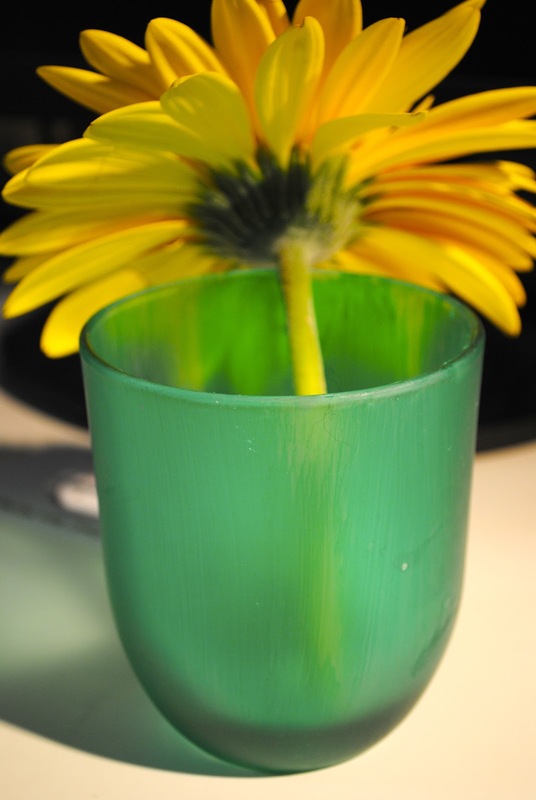 I think I will use mine as a pen and pencil holder on my desk but here it is with a really pretty daisy for looks.